Botanical Name: 1. Ligusticum sinense oliver; 2. Ligusticum jeholense Nakai et Kitag. 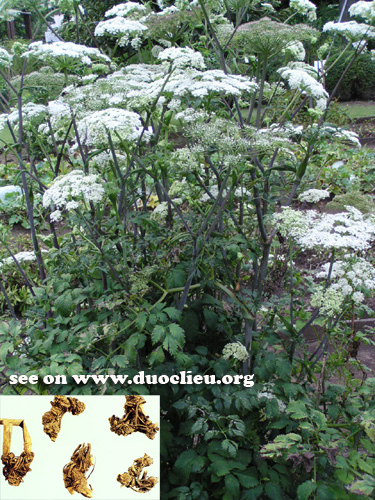 Common Name: Ligusticum root, Chinese lovage root. Part Used & Method for Pharmaceutical Preparations: The roots are dug in spring. After the fibrous roots have been removed, they are dried in the sun. Then, after soaking them in water, the roots are cut into slices. Functions: 1. To expel cold and release the exterior; 2. To expel wind and dampness; 3. To stop pain. Dosage: 2-10 g, decocted in water, or in pills or powder form for internal use. 3. For rheumatic arthralgia and other kinds of pain in the limbs and joints due to Wind Cold Dampness, it is used with Radix Saposhnikoviae (Fang Feng), Rhizoma Notoperygii (Qiang Huo), Radix Clematidis (Wei Ling Xian), and Rhizoma Atractylodis (Cang Zhu).